We’d love your help. Let us know what’s wrong with this preview of Awakening the Heart by John Welwood. Can a meditative practice assist and promote the healing relationship between psychotherapist and patient? The notable contributors to this practical book draw on a wide range of Eastern and Western disciplines—psychoanalysis, Gestalt, Aikido, and various Christian, Hindu, and Buddhist contemplative traditions—to show that it can. What they propose is a meeting between the Can a meditative practice assist and promote the healing relationship between psychotherapist and patient? The notable contributors to this practical book draw on a wide range of Eastern and Western disciplines—psychoanalysis, Gestalt, Aikido, and various Christian, Hindu, and Buddhist contemplative traditions—to show that it can. What they propose is a meeting between the Western psychotherapeutic approach—grounded in working with the personal problems and the need to carve out a strong awareness of self—and Eastern tradition, which emphasizes a larger kind of awareness and equanimity as a continuously available source of clarity and health for those who know how to find it. They show that joining psychotherapy with meditation can mutually awaken the hearts of both therapist and client, sparking them both to open more fully. To ask other readers questions about Awakening the Heart, please sign up. Rich, sensational compilation. Nearing 30 years old, I think this book is a testament to what is at the heart of therapeutic encounters - the simplicity of two people meeting, and the power of the therapist's presence. It covers many facets and topics to do with the meeting of spirituality, contemplative practice, and therapy. The writing is beautiful and personable. And each chapter is direct and goes straight to the heart of what is being spoken about - it is both broad and deep in this respec Rich, sensational compilation. Nearing 30 years old, I think this book is a testament to what is at the heart of therapeutic encounters - the simplicity of two people meeting, and the power of the therapist's presence. It covers many facets and topics to do with the meeting of spirituality, contemplative practice, and therapy. The writing is beautiful and personable. And each chapter is direct and goes straight to the heart of what is being spoken about - it is both broad and deep in this respect. I'm left feeling after each chapter, like nothing more needs to be said; it's just enough. I'm not sure how this book was compiled, but I think each chapter was written of the back of the one in front, with a number of authors referring to earlier chapters. There's a flow in the book, and I think it may in part come from this - like each chapter is a smooth turn in the road, rather than leaving you feeling like you've been dropped on another continent altogether. Despite being published in 1983, the opening chapters look at the similarities and differences of psychotherapy and spirituality remain relevant. As arguably each individual working in the therapeutic field and each person (perhaps contained to those in cultures where 'psychotherapy' is rampant) striving to end their own suffering coming up against the question of where the work of therapy meets spiritual transformation. Does one need a spiritual guide or therapist? Does one need to build and strengthen the self or transcend it? The authors certainly don't provide the answer to these for any individual but do nicely in delineating the different paths that each may lead, and collide. The middle section looks at working with spiritual practices and therapeutic goals. Seasoned practitioners in both respects share their own personal journeys into the confusion and conundrums of their suffering and spiritual life. Always nice to read of others (sane) stumbling through experience. And the last section gets into the therapeutic side of these encounters, and some of the skills, attitudes, practices and approaches needed to engage clients and accompany them on their path into suffering/to healing. There is so much in this book - I will definitely return time and time again to grab a wise word or two, to both recenter and ground, and as encouragement to keep stepping into experience, namely suffering. So rich in insight. Really helped me look at psychotherapy in a different way. Highly recommended. John Welwood is an American clinical psychologist, psychotherapist, teacher, and author, known for integrating psychological and spiritual concepts. Trained in existential psychology, Welwood did his Ph.D. in clinical psychology from the University of Chicago in 1974. He has been the Director of the East/West Psychology Program at the California Institute of Integral Studies in San Francisco, and i John Welwood is an American clinical psychologist, psychotherapist, teacher, and author, known for integrating psychological and spiritual concepts. He has been the Director of the East/West Psychology Program at the California Institute of Integral Studies in San Francisco, and is an associate editor of Journal of Transpersonal Psychology. 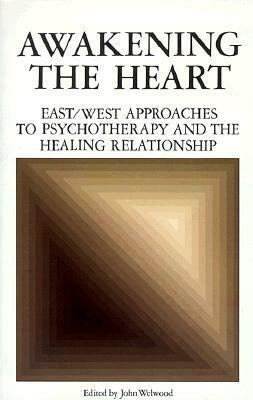 A prominent figure in transpersonal psychology, he is a pioneer in integrating Western psychology and Eastern wisdom.